I may not have any right to review director Paolo Sorrentino's (The Great Beauty) new film given I'm what I'd consider a youthful twenty-eight and this is clearly a film meant to elicit the broad scope, the big picture or the authentic perspective of an experienced life. I recognize that I can't even attempt to understand all of what this film is trying to say or all of what Sorrentino hopes to accomplish with such a work, but I feel I can at least recognize what he is going for. In fact, one character even describes the seeming intent of Youth within the film when he describes the film he's set to direct himself as a, "sentimental and intellectual last statement." 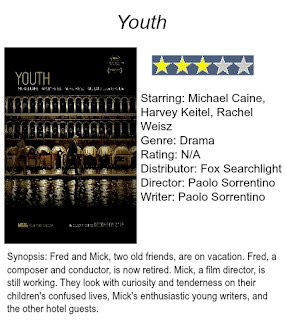 While Sorrentino himself seems far from this stage of his career it seems as if that's the kind of film he intended to produce here; a sentimental ode to aging and the wisdom that experience and perspective bring while simultaneously becoming too old to recall any of this knowledge as processed through the guise of an intellectual. There is no issue with the aspiration as I would love to bear witness to a film that does some kind of justice to the striking injustice that is finally reaching a point where you might find some true hint of understanding only to develop Alzheimer's or croak the next day, but Youth is more a film that serves as a discussion of such philosophies and ideas rather than one that tells a story that conveys such ideas. In the loose story it does have, we come to know Fred Ballinger (Michael Caine) and Mick Boyle (Harvey Kietel), two old friends who are on vacation in an elegant hotel at the foot of the Swiss Alps. Yes, it is one of those movies where all other obstacles any individual might face are put aside for months at a time in the wake of vacation just so they can focus on and over-analyze the existential questions that bother them. Fred is a well-renowned composer and conductor who is now retired, but is being coaxed out of it by the Queen who hopes he will play his songs for Prince Philip on his birthday. On the other hand there is Mick, a film director, who is still working and feverishly at that. He is writing a new script with a think-tank of young writers who seem to misunderstand him more than anything. It also happens to be fact that Fred's daughter Lena (Rachel Weisz), is married to Mick's son Julian (Ed Stoppard). That is, until Julian tells Lena he is leaving her for pop star Paloma Faith and thus resorting Lena back to the shelter of her fathers wings and giving cause for both Fred and Mick to reflect not only on their children's lives, but their own. The clear highlights of the film are it's distinctive look and the two lead performances by veterans who have such a depth of acting knowledge that their perspective oozes out of their pores. I'll admit to not having seen any of Sorrentino's previous work, but I think it is safe to say that when it comes to style he is very much about the composition of his shots. Every angle is no doubt justified by some bigger reason that only the contents of the shot can further emphasize while the vibrant colors and beautiful scenery serve as juxtaposition to the dark turmoil that is taking place within our lead characters. Furthermore, Caine constantly repeats how everyone refers to him as being "apathetic" and as true as that may be to those who know him best, Caine is able to make Fred an appealing and deeply interesting guy who clearly isn't good at communicating how he feels, but feels a great amount of things nonetheless. Kietel is especially endearing here as his Mick couldn't be further from Caine's Fred. Rather than taking a seat on the sidelines, Mick would rather continue to risk his already refined legacy by continuing to produce content. Spearheaded by these two performers Youth is never about something as simple as our leads questioning what was most important in their lives and how they screwed it up by not paying enough attention to it when they had the chance, but more it seems to want to teach us to be aware of the time in this planet's history that we occupy and what that means if we're to be remembered for anything after we've gone. The truth is, most of us won't be concerned with such thoughts that feel too far out of our hands to even hope to control. Fred and Mick both know they're best days are behind them, but while the plot synopsis tries to make it sound as if the device pushing the narrative forward is that mysterious agent trying to get Fred to conduct again the real story is simply the evaluation of their lives as they knowingly near the end of them and the wondering as to what it all might have been for, if anything. Sorrentino conveys these ideas in lurid fashion by using jolting musical cues and searing commentary on the commercialization of cinema that is presented through exchanges specifically set up to prove a certain point of view. This, for me, is where the film runs into it's issues as none of the situations feel natural, but more forcefully set-up circumstances for the sake of Sorrentino's point. This is especially clear in a scene where Weisz delivers a biting monologue to her father that is magnificently performed, but feels undermined by the fact the two are getting mud baths together. There are shots of the young serving the old in this fanciful hotel and of the old sitting in saunas allowing their old skin to moisten while the young get ready for the day with their smooth skin almost teasing their guests. These establishing shots say a lot and convey the necessary ideas and drastic difference the years make, but while the execution is clearly pristine there is not enough substance in the total package to make the product feel satisfactory. Where Youth does shine is in it's exchanges between Paul Dano and Caine. While Caine and Keitel's scenes are more interesting when they're on their own rather than when they take a walk in the woods, Caine and Dano establish an interesting dynamic with one another immediately. Dano plays Jimmy Tree who seems to be something of a method actor who is preparing for a role while staying at the hotel. He has been pigeon-holed by his most popular role and hates to think it will be all he's remembered for. He relates to Caine's Fred in that he believes Ballinger has also been pigeon-holed by his most popular material rather than the wealth of music he has created for the world. The intermittent exchanges the two have open each others respective minds to different ideas insinuating no matter what age you are, there is always more to learn and a different way to view things. Lastly, the highlight of the film is a short appearance from Jane Fonda who absolutely steals the show with her self-deprecating and over the top performance that hits Sorrentino's biggest nail on the head. In this scene alone the writer/director provides more context for his ideas than at any other point in the film and is only a hint of what a testament to youth and aging this could have been.